Mobile phones are the success story of bridging the rural digital divide, bringing tangible economic benefits and acting as agents of social mobilization through improved communication. But what are the real challenges that face reaching rural areas, and what are some of today’s most beneficial applications that can help these rural communities, specifically regarding agriculture development? This Forum will examine the challenges that rural communities face in enhancing the benefits of mobile telephony, and look at some examples of interesting initiatives and good outcomes from around the globe. AHM Sultanur Reza, Additional General Manager and Head, Community Information Center, Grameenphone Ltd.
Jo Cadilhon from FAO about the KS Workshop: KS is Collaborative, Flexible, and Fun. As part of my work as Marketing Officer (Quality Improvement) at FAO’s Regional Office for Asia and the Pacific, I am involved in sharing knowledge and information about new marketing best practices with my colleagues in the regional office’s informal and multidisciplinary Commercialization and Agri-Business Interest Group (CABIG). As a coordinator of CABIG – pronounced “cabbage” – I decided to attend the Second FAO/ICT-KM Knowledge Sharing Workshop to learn about innovative knowledge sharing methods that will enable me to make the most of group discussions in my workplace. I also hoped to discover new web-based tools that can help a community of practice, the members of which do not necessarily have the time nor financial means to meet face-to-face, to collaborate remotely. The workshop helped me to explore knowledge-sharing challenges and opportunities, and how to make the most of face-to-face collaboration. We also discussed alternatives to email and tools for virtual collaboration. This was extremely useful as most of my work in a decentralized office of FAO also makes me interact frequently with my Headquarters colleagues and supervisors in Rome by email. The workshop also allowed me to learn tips in order to become a better facilitator of meetings and group discussions, which will also help me in my work. To sum it up in just three words, I have realized that knowledge sharing is collaborative, flexible, and, very importantly, fun. 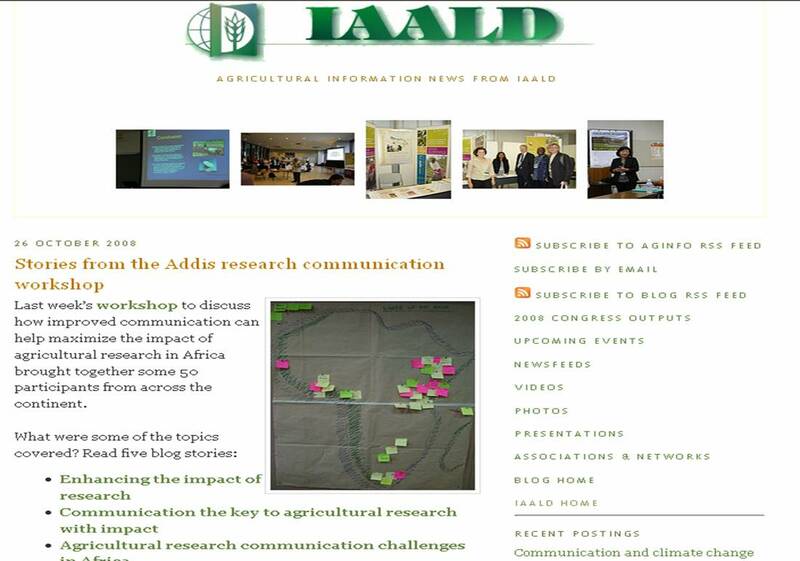 At the recently held “Maxmising the impact of agricultural research in Africa: A workshop on research communication” in Addis in October, a number of ways of capturing, documenting and sharing the workshop were carried out. These are becoming available though a number of different channels–read on for ways to find these resources. Peter Ballantyne, President of the International Association of Agricultural Information Specialist (IAALD), was not only a participant at the recently held “Maximising the impact of agricultural research in Africa: A Workshop on research communication” but played an active role in documenting the workshop through blog posts as well as blips (small video clips) of interviews with various organisers and participants in the workshop. These comprise a series of short blog stories with links to some short video interviews taken by Peter in Addis. These are reflections from Agnes and Marco about Open Space Technology which was used during the face-to-face phase of the 2nd FAO KS Workshop. Agnes’ first words were: lots of new Ideas! And the interview could have stopped there. But there’s more. She came to the workshop with specific needs so throughout the process she always kept her ears and eyes wide open to pick up every little detail. Open Space was engaging, constructive and a good learning experience. How? The idea of people with specific needs converging and discussing real issues was great. Agnes felt fully involved and was glad to hear experiences from a diverse group of people. In particular, she found the session on Intranets very remarkable since it gave her hints for concrete application in her work space. Besides the content discussed, Agnes particularly enjoyed the process of Open Space (and other methods) because it gave her the opportunity to interact with other participants. The social aspect of the process helped to share and take in from the whole experience. 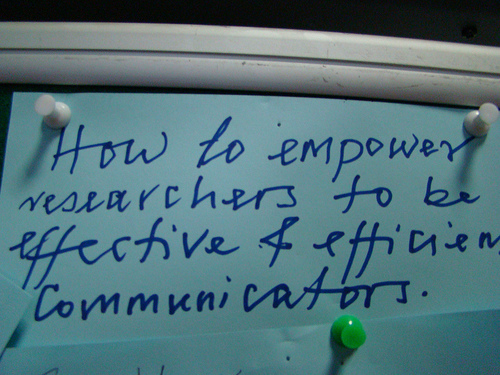 Marco’s idea of attending the workshop was to explore tools and methods used in knowledge sharing. 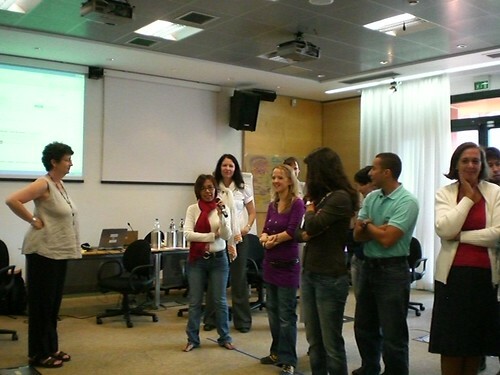 Open Space among other methods experimented, was an experience he found good for motivating participation. This was particularly with the concept of having participants develop their own agenda. He was skeptical about this at first, but later appreciated the freedom and democracy the approach gave to the participants. 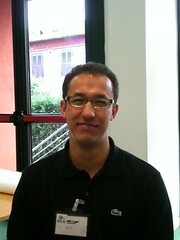 Marco’s observation about the sessions was that there was a mix between specific and more general topics. He points out that much as the process was quite engaging; especially in delicious and community radio sessions, content was not fully analyzed in others. He admits that generally, he benefited not only in understanding content but also application of the processes. He appreciates the fact that his quest has been met given that the exposure he has received will help him find possible applications in his work. Have a look at Nancy White’s post on the KS Workshop. Her reflections will be followed soon here by a summary of the participant’s feedback.